My thoughts: I absolutely LOVE this series, in fact it is one of my favorite cozy mystery series – since I am an avid coffee drinker. However, I can’t believe I’m typing this and admitting this, but this book in the series feel quite a bit short for me. Not my favorite, by any means. I felt like the whole storyline was just a bit disjointed for me. It seemed to go all over the place for me. Not to mention, I personally just didn’t enjoy the whole family history storyline so that didn’t help matters much. And what bothered me most about this one is that Claire and the coffeehouse gang really never hung around the coffeehouse in this book, they were out and about in the city, etc. I know this seems incredibly odd and petty perhaps, but one of my favorite parts about reading cozy mysteries is that they are set in their cozy places whether it be a bakery, a tea shop or in this case a coffeehouse. Please take us back to the Coffeehouse! All in all, just a so so book in this series for me! Not my favorite! My thoughts: I absolutely love this series . 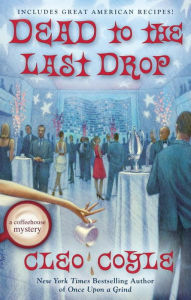 . . but I will have to say that “Dead to the Last Drop” has got to be the best one in the series yet! LOVED IT! Welcome to the Village Blend, DC coffee shop and Jazz club – yes! Welcome to a new location, new characters, new intrigue – Yes! I absolutely love the fresh perspective that this installment takes having our wonderful coffeehouse characters Clare, Matt, Quinn, and the gang taking their show on the road for a new Village Blend opening in Washington, DC. I loved the wonderful blend of new characters based in the DC coffee shop and our favorites based in New York! I must say I am a huge cozy mystery fan and often find they can easily tend toward the formulaic, cheesy side . . . but not this one. This Coffeehouse Mystery felt as if it totally broke from the cozy mold and almost felt to me like a true mystery/thriller than any type of cozy. I loved the intrigue of the Washington DC scene . . . I loved the historical perspective of learning about DC, its landmarks, Presidential politics and the like. Are you getting the overall impression that I loved this book . . . then you are right! Best book in the series . . . and of course I very much look forward to seeing where #16 takes us. I’m a little sad I have to leave my coffeehouse friends for another year! Get your hands on this book now! 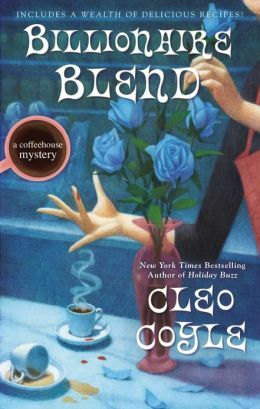 My thoughts: Anyone who has ever read my blog before knows that I absolutely love the Coffeehouse Mystery series by Cleo Coyle! Perhaps it is because I myself am a full-fledged coffeeholic or perhaps it is because I simply can’t get enough of the Village Blend and its cast of characters. Although I have fully enjoyed every book in this series, I must say that “Billionaire Blend” has to be one of my favorites to date! It literally was the type of book I couldn’t put down . . . which frankly isn’t always the case in the cozy genre. Billionaire Blend has a real energy and excitement that is often missing in the cozy genre. I think this may have stemmed from the very modern topic of development of computer applications and billionaire lifestyles. And I thought I knew about coffee . . . but wow, this book will teach you a great deal of coffee, from different coffee drinks, to coffee growing around the world. This author know her stuff! I love what the author is doing with character development of some of our every favorite cozy characters and I am excited to see where she goes with this in her next book. What is happening between Claire and Mike Quinn? What is the future like for Joy and Franco? I can’t wait to find out. Now if only there was a true Village Blend in every community . . . I so want to go there!!! In short, it was a great book! Head to the store or your local library, sit down with your favorite cup of coffee, and have a wonderful journey! 1. The main character, Clare Cosi, is a strong, empowered female character. She has a head on her shoulders and isn’t a ditzy character (which drives me crazy). 2. The main setting in the series has to be ultra inviting and I have to want to be in that place. The Village Blend definitely qualifies. Every time I read a Coffeehouse Mystery, I long to be in that very place. I have a vivid picture in my head of what The Village Blend looks like to me, where the tables are, what the coffee bar looks like, what the upstairs looks like! The more I read this series, the more I just know The Village Blends exists . . . somewhere . . . and I need to be there! This book includes some delicious looking recipes in the back for cookies and other sweet treats! Can’t wait to try some! In short, this series is an absolute MUST read! I can’t wait for the next installment – “Billionaire Blend” due to be released in October 2013! Go out and get this book along with the previous 11 in the series. You won’t be sorry! A shocking hit-and-run in front of her Village Blend coffeehouse spurs Clare Cosi into action. A divorced, single mom in her forties, Clare is also a dedicated sleuth, and she’s determined to track down this ruthless driver who ran down an innocent friend and customer. In the meantime, her ex-husband Matt, the shop’s globetrotting coffee buyer, sources some amazing new beans from Brazil. But he soon discovers that he’s importing more than coffee, and Clare may have been the real target of that deadly driver. Can ex-husband and wife work together to solve this mystery? Or will their newest brew lead to murder? Includes recipes. My thoughts: I have found myself in a bit of a reading slump lately. For an avid book reader and lover of books, this feels like a day without sunshine or if you should check if something is really wrong 🙂 So I decided to delve into some of my favorite cozy series to see if that could give me the jumpstart I needed. This 11th book in the Cleo Coyle Coffeehouse Mystery Series did the trick and definitely did not disappoint. I have to say hands down that this has got to be my favorite cozy series. Perhaps it is because of my excessive love of and addiction to all things coffee – yes in fact I am enjoying a nice warm, strong cup of Kona directly from Hawaii as I write this 🙂 In my opinion, cozy mysteries are supposed to be just that – cozy! Isn’t that why we read them, because we want to be transported away from our everyday life to that cozy spot, that bookstore, that sewing shop, that . . . whatever it is for you. The coffeeshop in this series, The Village Blend, does just that for me! I have this vivid picture in my head of how the coffee shop is all set up and where I want to sit as I tuck in with my warm coffee and a favorite book! When I read this series, I can literally smell the coffee roasting in the basement, can taste the perfect espresso shot, and can taste the decadent desserts that are whipped up in the kitchen! This series provides the perfect escape! The characters are just plain delightful! They are quirky, fun, creative, strong, and just plain likeable. Everytime I open the pages of the books in this series, I feel like I’m somehow walking back into people I know and love! I really enjoyed the overall storyline and plots in this particular book. Let’s face it, cozy mysteries can seem rather cheesy and formulaic at times, but this series just doesn’t feel like that to me! I highly recommend you make yourself a cup of coffee, a latte, a cappuccino, or whatever your drink of choice is and start this series! you won’t regreat it! Book #12 “Holiday Buzz” is available December 4! A perfect way to take some time to relax during the busy Christmas season.